In 1843, William Matheson converted an old brewery at Tain, Easter Ross, into a distillery – and Glenmorangie was born. As the Highland single malt celebrates its 175th birthday, Richard Woodard delves into its past, present and future. When Alfred Barnard visits Tain in the mid-1880s for his book The Whisky Distilleries of the United Kingdom, there is no airy still house, no eight-metre stills throwing their gleaming copper dizzily upwards; just a ramshackle farm distillery ripe for reconstruction. But Barnard’s call at Glenmorangie comes on the cusp of the most significant change in the distillery’s long history. Within a few years, it will be reborn. Barnard’s ‘gentle uplands and well cultivated farm lands’ offer an ideal hinterland for a malt whisky distillery. These are the fertile, sheltered barley fields of Easter Ross, not far from fabled Ferintosh and the cradle of commercial whisky distilling. Perfect for brewing; perfect for distilling. Whisky came to Tain when William Matheson bought Morangie Farm in the early 1840s. Matheson funded the purchase from his work up the road at Barnard’s previous destination, Balblair; so, on finding a brewery on the estate, converting it into a distillery was a logical next step. In the same year, William Matheson died, leaving his widow Ann and eldest son John to run the distillery (by the time of Barnard’s visit, the youngest son, another William, appears to be in charge). Glenmorangie was swift to capitalise on the arrival of the railway: by 1872, a warehouse in the City of London was stocked with 20,000 gallons of its whisky, and adverts in provincial newspapers from Ipswich to Oxford helped to establish a network of local sales agents. ‘It gives the lie to the idea that no-one drank single malt outside Scotland until 1963,’ points out Russell. The changes of the Victorian era find echoes nearly 120 years later, when Moët Hennessy, the wine and spirits arm of French luxury goods giant LVMH, buys Glenmorangie from the Macdonald family. Unusually for Scotch, the water of the Tarlogie springs is hard, not soft, and mineral-rich – one more factor in creating Glenmorangie’s distinctive style of whisky. ‘Glenmorangie’s fermentation time is 55 hours, and I remember I was quite shocked by that when I started, because to get such a fruity spirit I thought you’d need much longer,’ says McCarron. ‘At Oban, it’s 120 hours. Originally, they may have been gin stills – that’s the legend, although Russell has found no hard evidence – before they are replaced with two giraffe-high pots shortly after Barnard’s visit. In 1976, following Glenmorangie’s revival as a single malt, two more pots are added in an increasingly cramped still house; then, in 1990, a three-storey warehouse is converted into a new still house, complete with eight stills, before four more are added in 2008. This spirit of innovation has also explored barley variety (Tùsail), heavily roasted chocolate malt (Signet) and, most famously, the manifold possibilities of cask maturation. It starts with the release of the 1963 vintage in 1987, then moves on to the original Glenmorangie 18 Year Old launch in 1990. A Port Wood Finish follows in 1994, Madeira and Tain l’Hermitage in 1995, and a fully-formed Glenmorangie Wood Finish Range in 1996. Not just finishing, but cask policy in general. McCarron reckons that, with Glenmorangie Original – the distillery’s core 10-year-old malt – 40% of the flavour comes from the spirit running off the still, and 60% is given by the cask. Glenmorangie also uses so-called ‘designer casks’ – wood sourced from the Ozark mountains of Missouri, with a five- to seven-year supply chain – to create Glenmorangie Astar, but with a proportion also going into Original. ‘We can never get enough of them,’ says McCarron. Following transformation and sale in the 1880s, Glenmorangie’s ambitions as a single malt grow further. As early as 1889, the distillery has an agency in the US, shipping whisky over in cask and bottling it in San Francisco. The owner of famed London restaurant Simpson’s in the Strand is a shareholder, aiding distribution south of the border. Skip forward to the late 1950s and David Macdonald, part of the new generation at Macdonald and Muir, urges the company to use its now rebuilt stocks to revive Glenmorangie as a single malt; he knows the whisky well, having joined the workers in end-of-day dramming sessions when sent to work at the distillery by his father at the age of 16. In 1959, Glenmorangie is bottled as a single malt once more, and its modern era begins. 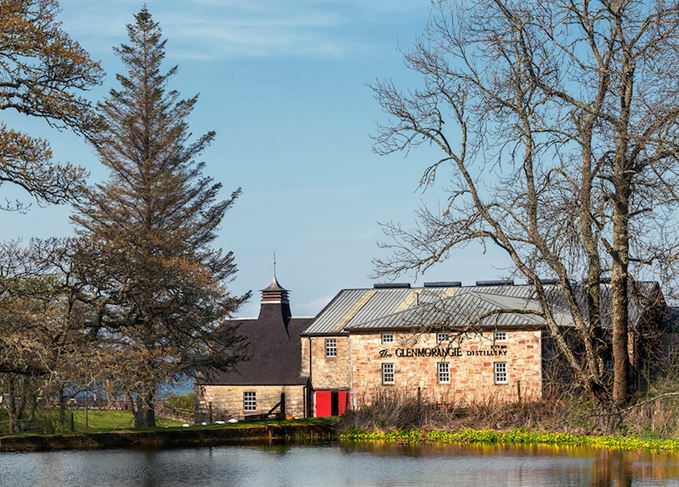 By 2020, Glenmorangie will have expanded again: two more stills, housed in an eye-catching new still house, plus a small new brewhouse and a little extra fermentation capacity. But does experimentation risk compromising the Glenmorangie style? ‘You need to have something that is recognisable as the house character,’ says McCarron. ‘That apricot, peaches kind of gig that’s going on in there.